Debit (Switch) cards are increasingly used, but funnily enough, credit cards are not quite as widespread as you might imagine. Although you shouldn't have many problems paying by credit card at established venues, elsewhere you may get a fairly negative response. Some pensions charge 5% extra if you play by credit card. 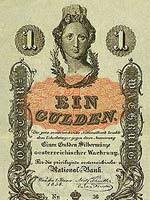 The Austrians ditched the schilling in 2002, being in the first wave of countries to adopt the Euro. (We were in Vienna on the first day of the new currency, and by nightfall it was a comical scenario trying to find a working cash machine as curiosity had prompted everyone to have a peek at the new notes). One Euro is made up of 100 cents, and Euro notes come in 5s, 10s, 20s, 50s and 100s. Ah yes, and 200s and 500s for playboys and James Bond villains. As it goes, the coins have preserved some local imagery. The good old Mozart adorns the 1 Euro coin, whilst much-loved landmarks such as the Belvedere, the Secession Building and St. Stephen's Cathedral decorate the smaller cent pieces. Cash machines are ubiquitous in today's Vienna, so unless you forget your pin number (OK, we admit we've done that more than once) you should be home and dry. Increasingly redundant, but if you're paying for your accommodation in advance cheques are often accepted. You'll find bureaux de changes at all the crucial points across, including the main train stations and the airport itself. In central Vienna, you may want to shop around a bit for the best rates. The general rule is the more central the less favourable. What do atms in vienna charge you when you use U.S. atm/debit card to obtain cash?